Mark Patterson, Executive Director at eLife reflects on a recent meeting at the Royal Society. by Mark Patterson, Executive Director at eLife. 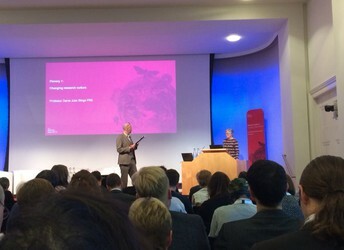 Towards the end of October I attended a truly inspirational meeting at the Royal Society on improving research culture. The meeting marked the culmination of two years work on this important topic and brought together participants representing a broad range of perspectives on science. Recurrent themes over the two days included encouraging collaboration rather than competition, committing to improve diversity and inclusion, and reforming the incentive system. These are all matters that we care about deeply at eLife. One of the main messages I took away from the meeting is that everyone and every organisation has a part to play in improving the current situation, and individuals as well as small teams can achieve extraordinary results. The biggest round of applause (as far as I could tell) came after the talk by Jess Wade, a physics post-doc at Imperial College, London. Jess described how she has been steadily adding biographies of outstanding female scientists to Wikipedia, to address the current striking gender imbalance. And this work is getting a lot of attention. Another highlight was Sue Wessler’s (UC Riverside, USA) talk about her efforts to improve the engagement of undergraduates in biology classes, particularly aimed at minorities. She described how she has recreated her lab so that undergraduates could gain a hands-on appreciation of what research is really like. And another wonderful talk was given by the entrepreneur Margaret Heffernan who shared many insights about teams and leadership. I was particularly struck by her discussion of Uri Alon’s efforts to create a more nurturing environment for scientists. The meeting involved a range of formats including a competition for new ideas that might have a positive influence on research culture. Alex Freeman (Winton Centre, UK) presented an ambitious vision for how research communication might be better adapted for the web and which was also one of the projects featured earlier in the year at eLife’s Innovation Sprint. Octopus won one of the prizes, and another winner was presented by Shirley Keeton from University of Reading, UK. Shirley described an idea to facilitate early-career researchers coming together in small multi-disciplinary teams to co-create and collaborate on new projects. One of our goals at eLife over the past few years has been to bring the early-career community more effectively into all areas of our work. Focusing on this part of the community has naturally improved the diversity of participation, and we hope that by continuing this effort we can inspire other similar initiatives and help to contribute to a healthier and more effective research culture. Questions and comments are welcome. Please annotate publicly on the article or contact us at hello [at] elifesciences [dot] org. For the latest updates on initiatives to improve research communication and other news from eLife, sign up to receive our bi-monthly newsletter. You can also follow @eLife on Twitter.